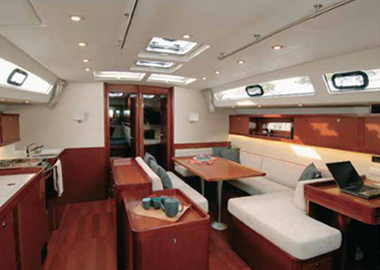 Length Overall : 50' 7"
Sail Area : 1,268 sq. ft. 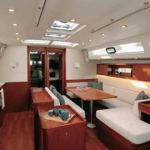 Innovative, spacious, bright, and sophisticated only begins to describe the exciting Moorings 50.5. 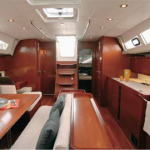 Designed by Berret-Racoupeau and built by Beneateau, she features a sleek coachroof, long side windows, a fully-integrated mainsail arch and all the ergonomic ease of detailed design to make the most of each area. Fitted with 4 main cabins and 4 electric heads, large salon and linear portside galley the Moorings 50.5 offers an abundance of interior space and comfort. 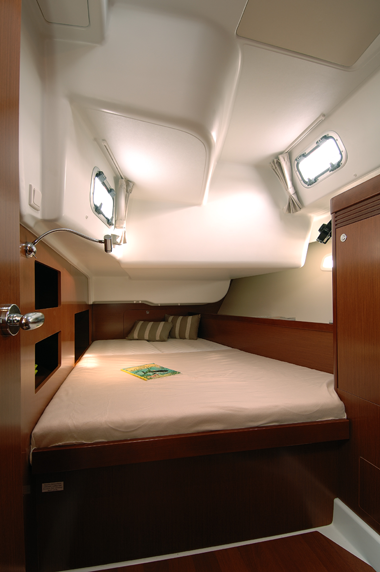 Located forward is an additional cabin, accessed via a hatch, with berth and head. 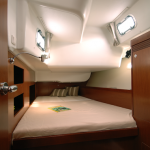 Plenty of opening ports and hatches provide excellent ventilation throughout the yacht. 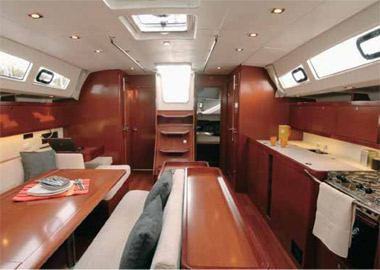 On deck, her spacious cockpit, foredeck and dual helm makes this yacht comfortable outside as well. The full electronics package includes a color chartplotter, autopilot, digital wind direction and speed indicators, and a VHF radio. 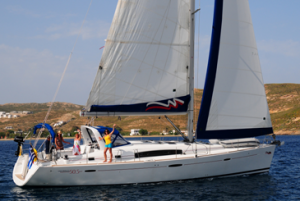 Air conditioner, generator, bow thruster, electric winches, and upgraded electronics result in a yacht that’s not only fun to relax aboard but a joy to sail as well. 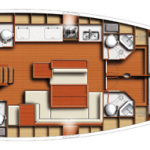 All in all, the Moorings 50.5 is thoroughly immersed in mod­ern design, technology and style.